bl.uk > Online Gallery Home	> Online exhibitions	> Asia, Pacific and Africa Collections	> Varkala Tunnel. 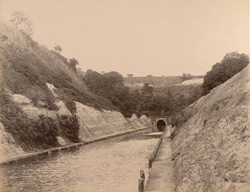 Photograph taken about 1900 by the Government photographer, Zacharias D'Cruz of the Varkala Tunnel, in the erstwhile Travancore. It is one of 76 prints in an album entitled 'Album of South Indian Views' of the Curzon Collection. George Nathaniel Curzon was Under Secretary of State at the Foreign Office between 1895-98 and Viceroy of India between 1898-1905. Varkala near Trivandrum is known for the temple of great antiquity dedicated to Janrdanaswami and for its mineral waters. Springs gush out of the cliffs that rise abruptly on the beach. There are two tunnels close to the temple constructed at a great cost by the Travancore Government and opened in 1881. One of them is nearly half a mile in length, bored through the cliffs linking the waterways on either side and establishing through-water communication between Trivandrum and Quilon.